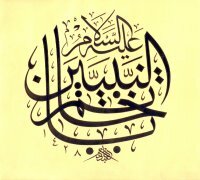 Another appellation used for Prophet Muhammad is Nuru'l-Huda (Light of God). According to reports, while Abdulmuttalib, the grandfather of Prophet Muhammad was sleeping in Hijr, he suddenly awoke startled. He replied: ‘I am one dear to Almighty God.' And then I woke up. The Quraishi oracles replied to him ‘If you really had this dream, then it means that a prophet will emerge from your descendents; everybody on earth and in the sky will have faith in him. The links of the chains are interconnected, which shows that the subjects and the helpers of the prophet will become abundant and strong. The transformation of the chain into a tree shows that the religion brought by this prophet will last forever and that he will have a high level of honor.' Later, on the day of Hunayn, Prophet Muhammad said "There is no denying this, I am a prophet. I am the grandson of Abdulmuttalib" (8); he was speaking of Abdulmuttalib's dream." (9). Love boils the sea like clay. Love smashes and melts the mountains like sand. Love ruptures the sky, opening hundreds of cracks. Love shakes the earth with no reason. Because of love, God said to him "If you had not existed...." He was solely of love. Thus, God selected him from among the prophets. If you had not been of immaculate love, if you had not possessed love, would I have created the heavens? I glorified the divine sky for you to understand the divinity of love. I completely degraded the soil and stretched it under mankind. For you to understand how a poor one changes with love, I gave the soil greenery and freshness. There is significant information in Imam Rabbani's Maktubat on Haqiqat al-Muhammadiyya. Firstly, he states that Prophet Muhammad was the reason for the creation of the universe in the 44th letter: "If Prophet Muhammad had not existed, Allah would not have created the universe and He would not have revealed that He is the Creator. Prophet Muhammad was already a prophet when Adam was between the water and the earth." Prophet Muhammad is the capital of earthly happiness and heavenly happiness. Prophet Muhammad is the reason for the creation of Adam. Prophet Muhammad is the pioneer and leader. 1. For the term Haqiqat, see: Ibn Manzur, Lisânu`l-Arab, Beirut, ts. X, 52; further, D.B. Macdonald, I.A., V, 100-1, Ist. 1977; Uludağ Süleyman, Tasavvuf Terimleri Sözlüğü, Ist. 1995, 215-6. 2. For this form of the hadith, see: Ibn Arabi, Futûhât, I, 243; Abu Bakr Sirajaddin, (Martin Lings) expresses that the other world existed before and after the time in its own unity and with all its traditional ranks. This understanding is expressed with the following hadith of Prophet Muhammad which refers to the creation of the body of Adam at the beginning of time and His own prophethood in the other world: “I was a Prophet when Adam was between the water and the mud” Therefore, it can be concluded that beyond mankind lies not only a historical and “horizontal” past, but also a spiritual and a “vertical” past. Abu Bakr Sirajaddin, The Book of Certainty; Yakîn Risâlesi, translated by Veysel Sezigen, Vural yay. Ist. 2006, 67-8; For an individual section on Haqiqati Muhammadiya, see: Michel Chodkiewicz, Seal of Saints, translated into English by Liadain Sherrard, Cambridge,1993, 60 et all. 3. Krs. Tabari, Tafsir, Saudi Arabia, 2003, VIII, 264; Bursawi, Tafsir, Translation, Hasan Kamil Yilmaz and others IV, 495; See also, Ferâh, 52, 91 yet, in some of the tafsirs this light is described as referring to the Holy Quran; Muhyiddin ibn Arabi, Rahmatun mina´r-Rahman, fi tafsiri isharati´l-Quran, Damascus, 1989, II, 13. 5. Nabhani, Yusuf ibn Ismail, Huccetullâhi ´ale´l-âlemîn, fî mucizâti seyyidi´l-murselin, Diyarbakir ts. 216-220; See also: The light over the foreheads of the forefathers. Ahatlı Erdinc, Peygamberlik ve Hz. Muhammed´in Peygamberligi, 89. 6. For information related to the issue See: A. Guillaume, The life of Muhammed; A.Translation of Ibn Ishâq´s Sîrat Rasul Allah; Karaci, 1982 68-9, Ibn Hisham, Sire, Beirut, 1971, I, 164-5; Abu Nuaym, Delail, I, 130 Haleb print, 90-1; Mawardi, A´lamu´n-Nubuvva, Beirut 1994, 291-2; Ibn Sad, Tabakat, Cairo, 1989, I, 95-6; Bursawi, Ferahu´r-Ruh, 89; Algul Huseyin, Islam Tarihi, I, 121; For a contemporary Persian sirat, the preface of which is written by Riza Tevfik and in which the desirer of this light, Fadima Al-Hashimiyya´s love for Abdullah is depicted exquisitely, See. Zeynel Abidin Rahnuma, Fahrialem, translated by Hayati Aydin, Cemil Sonmez, Ist. According to the work in 2004, Prophet Muhammad met this woman on the day of his mother´s death. For information on the issue See: “Nur-i Muhammadi” article of Louis Massignon in I.A, IX, 362, 1964. 7. U. Rubin, Pre-existence and Light:Aspects of the concepts of Nur-i Muhammed, Israel Oriental Studies, V/62-119, Tel Aviv, 1975. 9. Bursawi, Tafsir, III, 377-8; VII, 277-8; Maulana interpreted the dream of a man in which a tree grew by sea as follows: “This infinite sea manifests the greatness of the Divine and Glorious Allah, the huge tree is the sacred existence of Holy Muhammad (pbuh), the branches of the tree are the ranks of Prophet Muhammad (pbuh) and the guardians, large birds, are their souls, and the sounds of these birds are the secrets and mysteries of their language.” Eflaki, Ariflerin Menkibeleri, translated by Tahsin Yazici, I, 595 Ist. 2001; See also; Annemarie Schimmel, and Muhammed is his Messenger, (Chapel Hill, 1985) 131; For a different version of the dream See: Ebu Nuaym, Delail, I, 99-100. 10. Ahmed ibn. Hanbal, Musnad, IV, 127; Bayhaqi, Delail, I, 83. 11. Böwering, Gerhard, Early Sufism Between Persecution and Heresy, this article was published within Islamic Mistisizm Contested, (ed. Frederick De Jong-Bernd Radke, Leiden, 1999). 60 vd. For the Turkish translation of the article, See; Abdurrezzak Tek, Zulme Ugrayan ve Ilhadla Suclanan Sufiler, UUIFD. XII, issue. 2, 2003, 361 et al. For a separate article related to Nur-i Muhammadi See; Demirci, Mehmet, Nur-i Muhammedi, DEUIFD. Izmir, 1983, I, 239; For Haqiqat-i Muhammedi and its historical development See; Same author, "Haqiqat-i Muhammediye", DIA, XV, 180; Kara, Mustafa, Tasavvuf ve Tarikatlar Tarihi, Ist. 1995, 147 et al. 12. Tustari, Tafsir, 15; For the interpretation of Sehl regarding Nur-i Muhammedi See; Böwering, Gerhard, The mystical vision of, existence in classical Islam: 149-151 Berlin, 1980; Böwering, "The prophet of Islam: The First and the Last Prophet", Within "The Message of the Prophet", 49-52 Annemaria Schimmel, ibid., excerpted from 125. 13. ureddin Ebu´l-Hasan, a.g.e., 141. 14. Yunus Emre, Divan, Prepared by Mustafa Tatci, 234. 15. Yunus Emre, ibid., 372. 16. İbnu´l-Arabî, Fususu´l-Hikem, Translation and commentary Ekrem Demirli, Commentary section, 522. 17. Futûhât, Translation, Ekrem Demirli, I, 390 et al. ; 416. 18. Futûhât, Beyrut, ts. III, 312. 19. Maulana Jalaladdin al-Rumi, Mathnawî, V, 223-4. 20. Schimmel, a.g.e., 133; for the exquisite opinions on the light of Prophet Muhammad and his first place in creation, see also Maulana, Mathnawi, trans. Veled Çelebi, MEB. Yay. Istanbul, 1991, II, 69 vd., VI, 150. 21. Bursawi, Tafsir, III, 377. 22. Bursawi, a.g.e., IV, 496. 23. 496 Rabbanî, Maktubat, Istanbul, ts., II, 192; for the translation of the letters in three volumes see Talha Hakan Alp and his friends, Istanbul, 2004. 24. Imam Rabbani, Mektubat, I, 88. 25. Rabbani, ibid. II, 522-5. 26. Bukhari, Manaqib, 18; Muslim, Fazail, 22. 27. Hakim Tirmizi, Kitabu Hatmi al-Awliya, 342. 28. Mahmud Shabustari, Gulshen Raz, (trans.) Abdulbaki Gölpınarlı, Ist. 1989, 31-32. 29. Ibnu al-Arabi, Fususu al-Hikam, Translation and commentary, Ekrem Demirli, şerh kısmı, 512 et al. 30. Maulana, Mathnawi, III, 97-98. 31. Ibnu al-Arabi, Futuhat, I, 223. 32. Bursawi, Tafsir, IV, 152. Please type '572' into this field.